I had a chance to speak with Cisco’s mobile data forecasting team about how video will increasingly drive the consumption of video data. While streaming from apps like Facebook and YouTube will continue to dominate, the company sees a bright future for drones and goPro broadcasting to become a significant part of the mobile video picture. Over the next 5 years Cisco expects worldwide mobile data volume to grow almost 10 times larger than today. It will increase from 3.7 Exabytes a month in 2015 to 30.6 Exabytes a month in 2020. In 2020, 45% of the volume will be driven by Asia-Pac, 23% in Europe (western, central and eastern included,) 14% in Africa and the Middle East, 11% in North America, and 7% in Latin America. Video is by far the most important component of the data load. It made up 55% of data in 2015, but Cisco expects that to accelerate through 2020 to reach 75% overall. Interestingly, there is little variation in consumption by region. Middle East and Africa is forecast to have the lowest video usage, at 72%, and North America the highest at 77%. Talking with the Cisco VNI forecast team, it is apparent that the majority of video consumed today is streamed from sites like YouTube and Facebook. 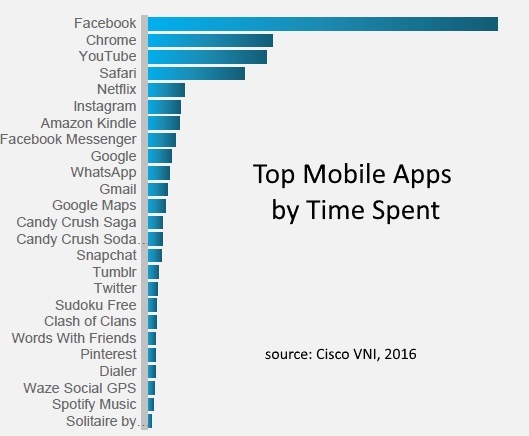 The company leveraged Verto Analytics to look at usage of the most popular apps on smartphones in North America. Facebook, the number one mobile app, has about 12% more users than YouTube. In terms of time spent with the app, however, Facebook users spend almost 3 times as long with the app than YouTube. Netflix has almost 5 times fewer users than YouTube, yet those users spend 1.5 times longer using the Netflix app than the YouTube app on their mobile device. According to Cisco, ambient video (from applications like Skype and security cameras) plays a very small part in driving mobile data usage compared to streamed video. However, the company sees a bright future for this category. The explosion of live streaming from goPro cameras, and drones is adding to the amount of “ambient” video already generated and should make it a much more significant category by 2020. As with broadband, a small percentage of users consume the majority of mobile data. Cisco looked at North American usage on tier 1 and 2 mobile operators. The company found that 20% percent of subscribers consume 51% of the mobile data bandwidth, and that 10% consume 42% of the data. The top 1% of users consume 7% of all mobile data bandwidth. Clearly, one of the most important elements governing the use of video on mobile networks is data caps. To illustrate this, Cisco drew on data from CTIA for North America. It found that just 27% of mobile data plans were unlimited, and drove an average consumption 6.4GB of data per month per user. For the 73% with a capped data plan monthly data usage was dramatically lower, at just 2.7GB per month. As the Cisco team pointed out in the conversation, forecasting the change in data caps is far from a linear process. 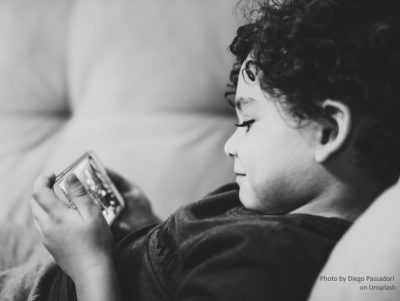 The introduction of zero-rated programs like T-Mobile’s Binge On can have a huge impact on the amount of mobile video and data a subscriber uses. That said, the company would be the first to admit that the forecast may not be representative of a specific operator in a country. Mobile video streaming from apps like Facebook and YouTube will continue to drive mobile data consumption. Mobile data caps are acting to constrain the consumption of video, and will continue to do so for the next 5 years. Video from drones and goPro cameras will join other ambient sources, like security and Skype, to become a more significant data driver by 2020.